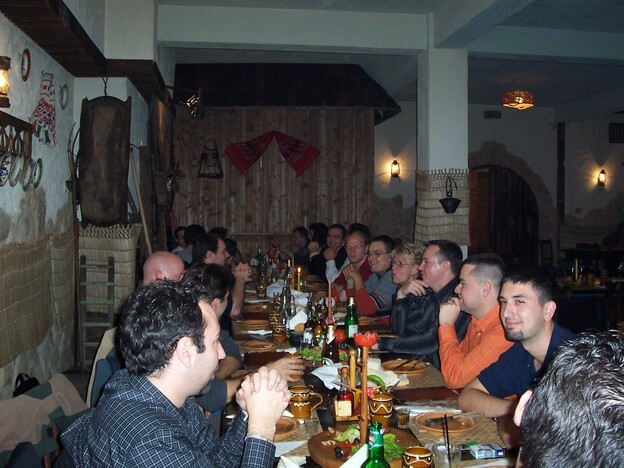 This week we were joined by the executive in charge of the Cluj office for a visit. 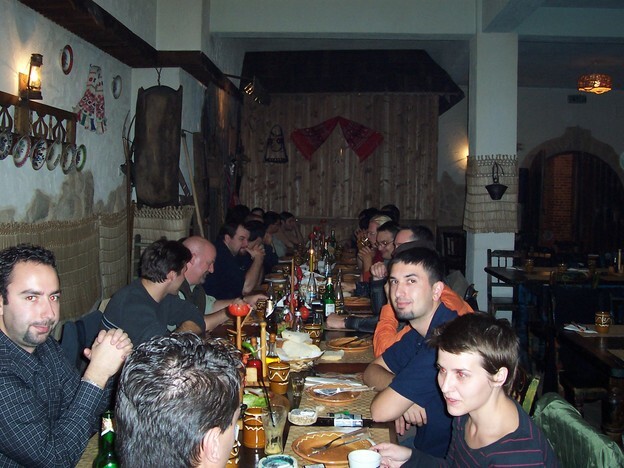 On Tuesday pretty much the whole office went out to eat at Cafe Ardeleana, a nice restaurant with traditional food. It's also one of the few restaurants that doesn't play loud techno music. Sorry about the red eye in these shots. I tried some of the local fare, including a shot of the Tuica plum liquor, which was jet fuel as far as I could tell, and a bunch of fatty meats and sausages. One of the items was just a hunk of fat, and the other was deep fried fat. Someone tipped off the office manager "Mama Anca" that I had been practicing in the office late at night, so she asked me to play. On the way to the restaurant I stopped by the music store across from our hotel and bought a music stand just in time. While we waited for the entrees I busted out my sax and played two movements of a Bach cello suite. Directly behind the table in these shots above is the non-smoking jail. Restaurants generally have some small incarceration chamber for non-smokers, and these are invariably empty. Next page Man Card revoked!